The Edmonton Oilers and captain Connor McDavid have agreed to terms on an eight-year contract extension worth $100 million that will kick in at the start of the 2018-19 season. The deal comes with a cap hit of $12.5 million annually and is far and away the largest cap hit ever handed out in the history of the NHL. Prior to this contract, the largest cap hits in the league belonged to Jonathan Toews and Patrick Kane of the Chicago Blackhawks who signed identical eight-year, $84 million contracts that came with $10.5 million cap hits. Anze Kopitar’s $10 million cap hit is the next highest after Toews and Kane, with Alexander Ovechkin ranking fourth with $9.538 million and Jamie Benn and Evgeni Malkin tied for fifth with $9.5 million annual cap hits. McDavid was a phenom coming out of the Erie Otters of the OHL, scoring 25 goals and 66 points in his rookie season, 28 goals and 99 points in 56 games in his sophomore season, and an astounding 44 goals and 120 points in his draft year. That production didn’t tail off at all when he made the jump to the NHL after being taken first overall in 2015. With 16 goals and 48 points in an injury-shortened 45-game season, McDavid proved that he was the real deal with his impressive speed and undeniable skill and work ethic. With a full 82 games under his belt in his second season, McDavid avoided the dreaded sophomore slump and scored 30 goals and 100 points, taking home the Hart Memorial Trophy, Ted Lindsay Award and Art Ross Trophy in the process. In short, McDavid has been everything he was advertised to be throughout the draft process. Named the captain of the Oilers after just his first season, it’s clear that the 20-year-old has already made an impact in the locker room as well. Despite his age, he’s a clear leader on and off the ice and it showed as the Oilers were finally able to escape the basement of the NHL in 2016-17 and not only make it to the postseason but play in the second-round as well, missing the Western Conference Finals by one game. While McDavid is scheduled to make a contract that will keep him with the Oilers until he’s 29 years old, he’ll likely get another big payday at that time given how young he’ll still be following this giant contract. 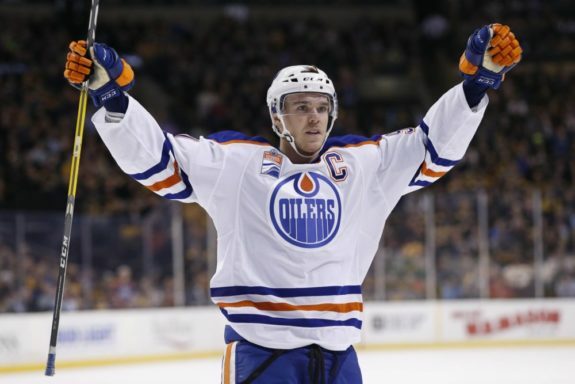 As a good, young player, McDavid has earned the right to ask for whatever salary and term he wanted. Still, the reports about McDavid’s deal leaked early and there was a large amount of backlash that surfaced due to McDavid ultimately “harming” the Oilers chances at being competitive with such a large cap hit that was originally reported to be $13.25 million per season by Elliotte Friedman. Whether this was the case or there was something else involved, McDavid ultimately chose to lower the figure to something he was more comfortable with, according to Bob McKenzie. The team will have to sign Leon Draisaitl at some point this offseason that will kick in one season ahead of McDavid’s — with the team’s captain asking for so much money, Draisaitl will be well within his rights to ask for well over $9 million as a result.